The top diplomats from South Korea and the US were set to meet Thursday in Washington amid continued efforts to achieve the denuclearization of North Korea, the Foreign Ministry said. South Korean Foreign Minister Kang Kyung-wha and US Secretary of State Mike Pompeo were scheduled to meet in Washington D.C. at 8:30 a.m., according to the ministry. Kang was in the US to lead South Korea’s delegation to the funeral of former US President George H.W. Bush. “They are expected to discuss agenda of the countries’ mutual interest, including a way to maintain coordination between South Korea and the US to achieve goals (of denuclearization of the Korean Peninsula and establishment of peace),” the ministry spokesperson Noh Kyu-duk told reporters at a regular briefing. It is their first face-to-face meeting since Oct. 7, when they held talks in Seoul following Pompeo’s visit to Pyongyang. 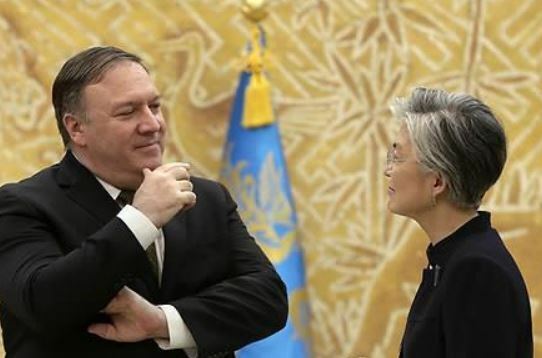 Kang and Pompeo are also expected to discuss North Korean leader Kim Jong-un’s possible visit to Seoul and recent developments in Washington’s engagement with North Korea. South Korea is hoping to host Kim in Seoul before the end of this year as part of efforts to boost the momentum for denuclearization talks between Pyongyang and Washington and for continued cross-border reconciliation steps. The US is preparing to hold a second summit between President Donald Trump and Kim early next year amid the stalled negotiations on dismantling the North’s nuclear weapons program. Seoul and Washington are also working to schedule a meeting of a South Korea-US working group this week via videoconferencing, according to the ministry. Led by South Korea’s top nuclear envoy, Lee Do-hoon, and his US counterpart, Stephen Biegun, the working group was launched on Nov. 20 amid speculation about a rift between the allies over their approaches to Pyongyang. The working group is aimed at better coordinating their North Korea policy on denuclearization, implementation of sanctions and inter-Korean cooperation. A South Korean government official said Lee and Biegun won’t join the upcoming video conference this time, according to a ministry official. The allies plan to hold a face-to-face working group meeting once a month and check on progress via videoconferencing when necessary. The second face-to-face working group meeting is likely to be held within this year, the official said.